Oklahoma's offense led the way through much of a six-game winning streak to begin Big 12 play. On Saturday against Baylor, it was the defense's turn to come through with some big plays for the No. 11 Sooners. Oklahoma forced three turnovers, its most of the season, and had several more interception chances in a 45-24 win over the Bears in front of 86,249 at Gaylord Family -- Oklahoma Memorial Stadium. 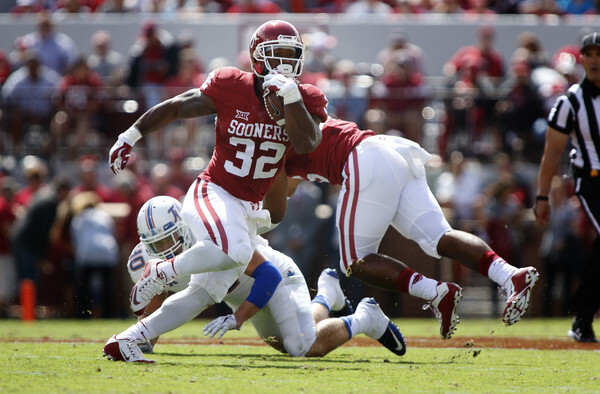 "Sometimes you get them in bunches," Sooners coach Bob Stoops said. "Fortunately we were able to get quite a few turnovers." Linebacker Jordan Evans had two critical interceptions, one on the goal line early that ended a Baylor scoring chance and another that he returned to the Baylor 1-yard-line to set up a touchdown one play later in the third quarter that put the Sooners firmly in control. No. 11/9/9 Oklahoma defeated No. NR/25/25 Baylor, 45-24, on Saturday afternoon for its 14th straight Big 12 Conference win, marking the second longest streak in program history. The Sooners won 17 straight Big 12 games between 2003 and 2005. The win marked the 100th for the Sooners at home under head coach Bob Stoops (record of 100-9 in Norman). OU owns a 23-3 (.885) all-time record against Baylor and is 12-1 vs. the Bears in Norman. In the Big 12 era, the Sooners hold an 18-3 series advantage (9-1 at home). Stoops is 15-3 vs. Baylor as OU’s coach (the 15 wins are his most against any foe) and 8-1 at home. Baker Mayfield and Dede Westbrook connected for a 40-yard score and Joe Mixon added a 56-rushing touchdown, OU’s 16th and 17th touchdowns, respectively, of at least 40 yards this season (leads the nation). Only four times in OU history have the Sooners had a player record at least fi ve touchdowns of 40 yards or more (from scrimmage) in a single season. Two of those have happened this season as Westbrook (10) and Mixon (five) have both accomplished the feat, joining Marcus Dupree (five, 1982) and Tommy McDonald (five, 1956). The Sooners finished with four rushing TDs, their second game this season with at least four scores on the ground (had five at TCU). The OU defense, which entered the game with seven takeaways on the season, forced three Baylor turnovers today. The Sooners held Baylor below their season averages in both points per contest (39.8) and total offense (541.8 yards per game).